Harpist of the Month of July, Caroline Reyes! Caroline Reyes is a recent graduate of the Eastman School of Music, where she received her bachelor’s and master’s degrees in harp performance, as well as a master’s in ethnomusicology. Besides being a fantastic performer and harp teacher, Caroline is a scholar and an active gamelan musician. Feminist Theory and Music Conference this week (Okay, A. Why didn’t I know about this conference and B. Why am I not going??). I’m sure I’m not the only one who would love to read this paper! Besides being a harpist and musicologist, Caroline is also a teacher. She holds the position of harp professor at Roberts Wesleyan College and is looking to start her own private studio. When I asked her what inspired her passion for teaching, she said, “Actually it’s funny, throughout my undergrad, I thought I never wanted to teach. But then, when I took Professor Bride’s pedagogy course, everything changed. I had this great relationship with my student and he did really well, and I thought oh my gosh, I’m actually pretty good at this!” Ms. Bride (our harp teacher) obviously thought so too, as she recommended Caroline for the job at Roberts Wesleyan after she had graduated with her bachelor’s degree. I explained to Caroline about my competition misgivings - I don’t really feel myself to be cut out for it, and every time I try for a concerto competition, I play miserably. She answered, “I used to feel the same way. But it was a really great experience, and what it’s good for is pushing yourself to really perfect pieces. I think that, for me at least, I would get things to the point where I was happy with them, but the idea of learning something so well that you can play through it without any mistakes is another level. I think that pushing yourself to that level is just good for you as a musician." Some of Caroline’s future plans include starting a private studio, continuing her teaching position at Roberts Wesleyan, and performing for the Rochester Fringe Festival. 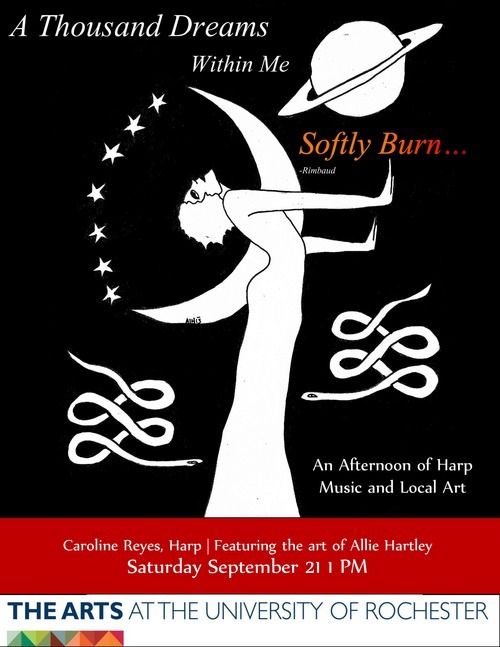 Caroline is collaborating with local artist Allie Hartley for the concert, which has a theme of dreams and nightmares. Some of the pieces on the program will be Tournier’s Clair de Lune and Eternal Dreamer, as well as a piece by an Australian composer, called Chamber of Horrors. The concert will be free, so if you’re in the area, you should check it out! Thanks for talking to me, Caroline!